The 158 series has been made by the German company ABUS for a long time. The body is made from die cast metal zinc and the lock comes with a hardened steel shackle, resistant to hack-saw attacks which makes it very strong and resilliant. The locks in this series are also weatherproof for normal outdoor use but not salt water environments. For salt water conditions see the 180ib range or the CP40 Marine or the Masterlock Stainless. 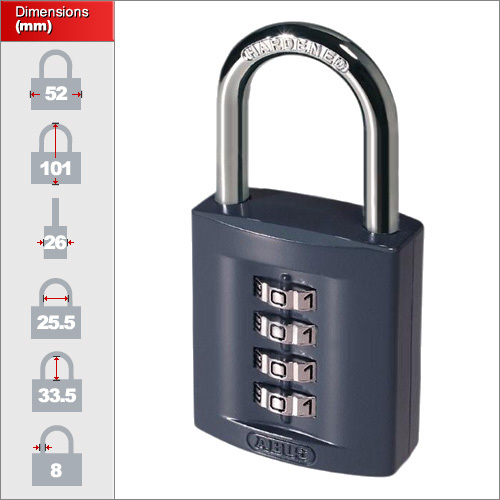 There are 3 sizes in this range and the largest 65mm option is quite a significant lock. Another pro to this padlock is that the combination can be changed easily when unlocked without the use of a key, but some may see this as a con. Please see video review to gauge how appropriate this padlock is for your needs. If you require a padlock that can only be reset using only a special key then please see our more high security models. We have three sizes in this range. The 40mm with a 6.5mm shackle uses 3 dials, the 50mm has an 8mm shackle and uses 4 dials. Finally the 65mm is the high security option with a 10mm shackle and 5 dials. 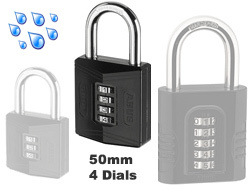 Much more secure than many smaller combination padlocks but retaining the same simplicity. Ideal for schools and offices where a medium security solution is required. A tangible ratchet combination mechanism makes setting the numbers easy even for hard of sight individuals. The casing is rivet free.